Welcome to 2801 Beechbank Road, a historic Mediterranean villa sited on a glorious lot overlooking the parklands of Capitol View Park. Simply put, there is nothing else like it on the market. The original section, built in 1926, boasts exterior walls of terra cotta with a true stucco application, terra cotta roof tiles with exposed rafters and original iron casement windows. A beautifully integrated addition was constructed in 2008 featuring true stucco surround, architectural series floor to ceiling casement windows, French doors and reclaimed wooden beams throughout. Some of the very special features and amenities include: custom fabricated iron work from the 1920s rarely seen in US architecture; solid knotty alder interior doors; antique wood and iron doors installed throughout; terra-cotta floors on main level in original section, 16 long wide-plank flooring face nailed using hand cut nails throughout main and upper levels and natural stone and herringbone brick floors on lower level; custom wood paneled walls & ceilings in lower level; custom hand-troweled fireplaces in living room and master bedroom; surround sound throughout; dual zone HVAC; multiple terraces; beautiful specimen plantings; pea gravel driveway with parking for 10+ cars and so much more. Must see to believe. 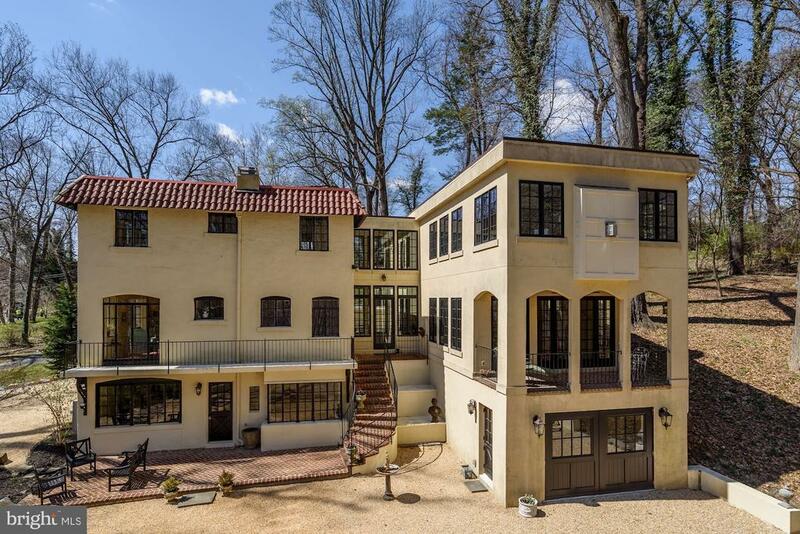 This is a once-in-a-lifetime opportunity to own a historically important home nestled in the park, just minutes to downtown, the Beltway and all of DC Area amenities.